There’s really only so much that can be done with a brown , a purple and blue glitter, and a pearly white polish that’s nearly dried out. 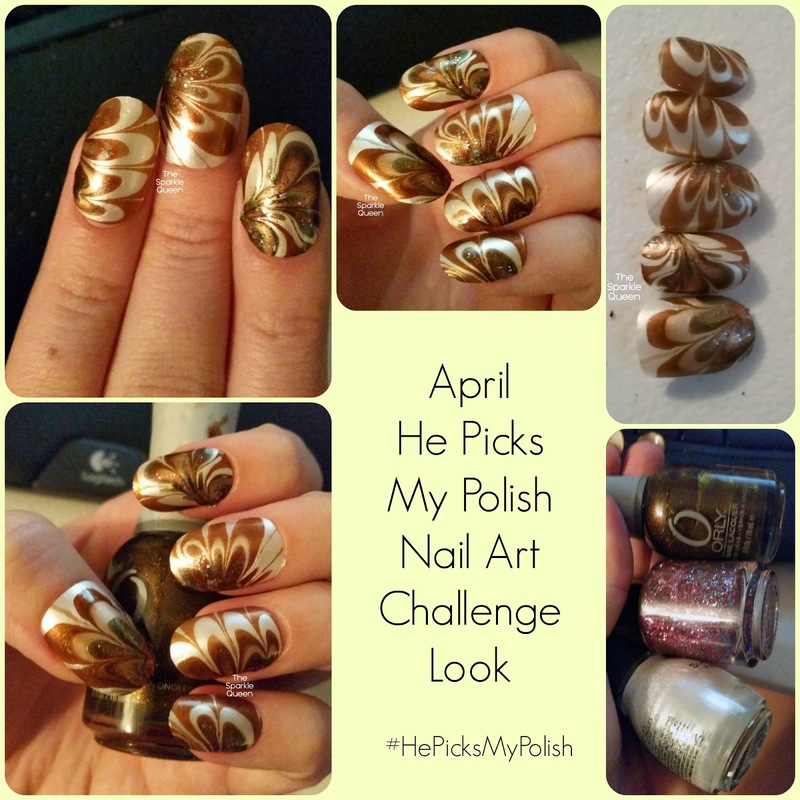 But somehow, by nothing short of miracle, I’ve put something together for the April #HePicksMyPolish nail art challenge. If you aren’t familiar with these challenges, check out THIS post to read all the details. I promise, it’s as easy as it sounds. He picks the polish, you make it work! No using other polishes except clear coats. The most shocking element of this design (besides the odd colors) was that the brown polish, when marbled, almost had the fainest of green undertones. It looked remarkably weird fresh out of the water during the marble process. Me – Purple and blue glitter – a mix of my own making! I did the bulk of the marble design with the brown and white, and put the glitter in the center of each nails marble design. Pretty much where the most detail is, I tried to follow some of the most inner layers with glitter polish. It made sense in my head at the time. And if you are ready to share this month’s link party with your friends, readers and followers? Log in to InLinkz, grab the code, and share. Want to join in? Feel free to share you looks. Oh, and be sure to join our Facebook group to stay up to date and discuss the looks further or to join in on future challenges. Join us on Facebook. That is one of my all-time favorite browns! Impressive watermarble too – Tokyo pearl can be a real challenge to work with! I think the result of this manicure looks just wonderful!